Metal Framing Roof lets Revit® users instantly create metal truss and/or rafter systems of any shape or complexity, perform structural analysis, and generate custom shop drawings. It gives a powerful boost to your BIM workflow. Functions are versatile, parameters easy to control, and changes occur in real time. No more drafting – just design and decide, knowing you’ll get a high-quality model. Metal Framing Truss+ gives Revit® users a single robust platform to generate light gauge steel truss systems for roofs of any shape, perform structural analysis, and auto-generate shop drawings. Functions are versatile, parameters easy to control, and changes occur in real time. It’s a potent BIM workflow booster: no more drafting – just decide and design. Build full metal truss systems in one go with the configurable 3D grid (escaping the limited and time-consuming nature of standard Revit truss family insertion). Easily assess steel truss options, in economic and engineering terms, to make the best choices. Freely revise your Revit model. Truss systems update and adapt. Get real-time take-offs and views, auto-sorting and dimensioning, and optional export to CNC machines (Howick, Pinnacle, etc.) with C+C and C+U support. Enables easy roof panel planning and splitting into segments for prefabrication, which can then be used in the roof framing process. Initially an architectural roof can be divided into coarse partitions, or regions. Regions can be created automatically based on the ends of roof ridges and the bottom ends of valley rafters as well as windows and generic or system openings with predefined distances. 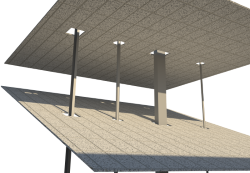 Roof+ automates metal framing roof work in Revit® projects. Robust features allow the user to efficiently frame metal roofs, complete with roof joists, battens, valley joists, roof boards, and more. Plus, the software automates shop drawings, including sorting, tagging, dimensioning, and scheduling all frames. 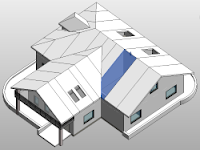 Create your own rules and templates and use them for detailed, multi-layer, metal roof framing creation in Revit models. Manage joists, rim joists, nogging, bridging, blocking, and bracing placement, and configure openings, details, service hole positions, and more. Revise your Revit model as needed, simply by selecting the elements and properties you want to modify. Roof frames and shop drawings update and adapt to any changes. Carry out structural analysis without leaving Revit. 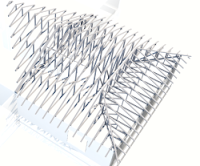 Automates metal framing work with rafter roofs in Revit® projects. Powerful, flexible, and easy to use. It helps you make optimal choices, move much faster, and avoid errors at every BIM stage – from design and documentation to fabrication and construction. 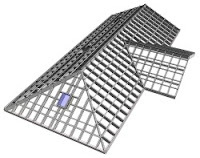 Create detailed, multi-layer, metal rafter roof framing in a snap for your Revit model using fully customizable rules and templates. Optional export to any CNC machine and CAD/CAM production line, such as Pinnacle, etc. Perform structural analysis without leaving Revit or export your metal frames to external analysis software at any stage of the design process. AISI S100-07/S2-10, North American Specification for the Design of Cold-Formed Steel Structural Members with Supplement 2. American Iron and Steel Institute, Washington, DC. AISI S200-07, 2007. North American Standard for Cold-Formed Steel Framing – General Provisions. American Iron and Steel Institute, Washington, DC. NASH Standard - Residential and Low-rise Steel Framing, Part 1: Design Criteria. 2010. NASH Standard - Residential and Low-rise Steel Framing, Part 2: Design Solutions. 2010. Building Enclosure Design Guide– Wood Frame Multi-Unit Residential Buildings. Homeowner Protection Office (HPO), Vancouver, Canada, 2011. AISI D110-07, Cold-Formed Steel Framing Design Guide, 2nd Edition. American Iron and Steel Institute, Washington, DC. AISI D100-08, AISI Manual, Cold-Formed Steel Design. American Iron and Steel Institute, Washington, DC. Metal Framing Roof is brought to you by AGACAD. Pricing was not known at press time.